After the elimination of the Military Draft, the US Military has since faced a delicate problem: how to make young people of a suitable and impressionable age want to sign up? They did it through a slick and continuous advertising program that especially seems to be specifically focused upon ... the United States Marine Corps. As every warrior comes soon-enough to know, this is not Reality. Furthermore, the campaign shamelessly targets the poor, the disadvantaged: the people for whom “dress blues” might be nicer clothes than their families could ever have afforded to give them. They are promised a future with meaning ... not a future of maiming or death. They are especially vulnerable. And so, they are the ones especially exploited. This song, then, is a protest. N-O-T against those who have honorably served in the military (thank you ...), but, rather, against the people who have commercialized it, and who, in so doing, have sought to reduce it to the contents of “a billboard in the rain.” This song is a protest against those who have trivialized the sometimes-mortal sacrifices of others ... and of their families and survivors ... by blatantly suggesting that sacrifice is somehow not involved. It is a protest against those who daily sell the notion that War consists of a glory-filled symbolic identity, rather than ugly personal hell. The specific phrase, “Semper Fi,” has been included in this lyric purposely (alternate: “Live or Die”), but with profound respect. ... They look so young and strong. ... Just kills them in the night. Is buried ’neath the land. A powerful and poignant presentation of your point of view. Thank you – mix comments? My purpose was simplicity bordering on austerity. Every time I tried in various ways to “flower it up,” I decided against it. The only thing that it does, really, is to add a few new instrument parts on each run-through. So, it remains, now, much like it first came to me last year when I was walking around the War Memorial in downtown Nashville ... a marble monument to the “Great™” War. To the “War to End All Wars.™” I almost thought that I heard that solitary, military drum in that cavernous hall. As always, I welcome comments about the mix. It sounds real good in phones; the bass is weak in the (MacBook Pro) computer speakers; it sounds bad in buds. As for the sentiment of this piece, I wonder what this two-year old boy will think of this image when he becomes a grown man? I wonder also what the widow thinks of it now. (Her empty gaze speaks volumes.) 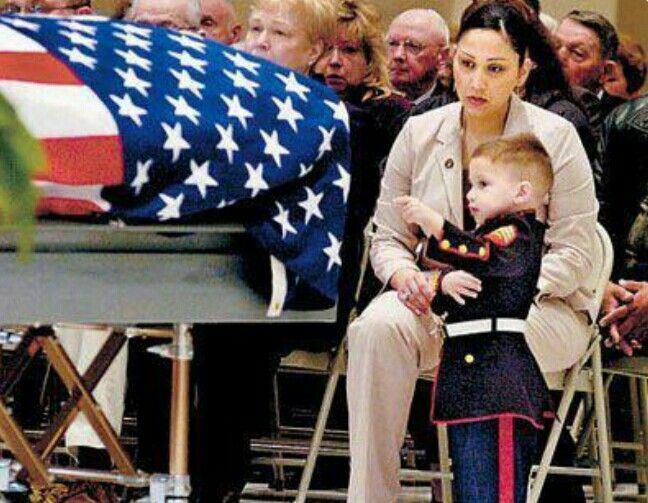 Plainly, the dead soldier bought into the “dress blues” image wholeheartedly, and taught it to his impressionable son. But now, he’s dead. And the benefits due the widow and her family don’t last for very long . . . Somehow, those billboards never get around to talking about The Wounded Warrior Project . . . If I could make this thing “go viral,” I would. Wow. I rarely see that difficult and dangerous line drawn between the action-movie *fantasy* of joining the military and the impossible-to-explain reality of what those young soldiers bring home illustrated this well. It's a tricky line, so easy to misunderstand and even easier to misinterpret. That second 'chorus' is unforgettable. It should be on a billboard of its own. And could maybe take a bit more starkness. A very dramatic piece. ... Shrouded In The Fog Of War. A powerful statement, to be sure and as long as there is hate, fear and greed in this world there will be a need for human fodder. Sadly, Advertising has become an increasingly powerful tool — in politics, in government and in war. The powers-that-be have used it effectively to divide and distract us, so that Eisenhower's urgent warning has reached monstrous fruition. You rightly point out that the shame belongs to those who engineer and promote war — and not to those who have honorably served. I recently lost my brother-in-law, a Marine Veteran of the Vietnam War. He was a man of quiet strength who readily helped anyone who needed it. We lost him to an enemy of ALL of us on this planet — Cancer. I can't help but wonder how long it would take to vanquish that common enemy... if we invested the hundreds of billions of dollars we spend — yearly — on defense, on cancer research, instead. "What Fools These Mortals Be." Very powerful. I like all the military trimmings you've engineered into this, and the ominous undertones throughout. Very good. As for the mix, well, I'm listening on some pretty decent reference monitors and everything is coming through loud and clear. Very effective piece of musical writing. Everything in the production works towards making and reinforcing your point decrying the commercialization of war. Bit late, Mike, sorry. Powerful, poignant reminder of the hidden (white-washed?) costs of war. Brings to mind that classic (oxymoronic) rallying cry, "Fighting For Peace"... The sympathetic arrangement works very well. Thanks. I'm absent from MJ way more than often these days, and would probably not have come to this except for your forum post. You've produced something very powerful here on a topic on which I have strong feelings. When the Australian government conscripted many young people for the Vietnam War, I was of conscriptable age (indeed people my age either side of my birthday were called up). My father, who was quite conservative in many ways, took me aside before the ballot and simply said "if your birthday is called, don't go - we'll do all we can to get you out of it". Dad spent many years in WW2 in the Royal Navy, and saw way more action than many. He was a total peacenik. This song would have had tears in his eyes, as it has had with me. On reading your forum post, I was wondering if, despite the quality of your own recording/performance, it may be a song that an established artist may be interested in recording. Not an ideal way of getting it out there, but my experience has been that no matter how much effort you put into getting a song "out there", the actual distribution can be miniscule at best. Congratulations on a really top notch post Mike! I consider this recording to be only a “scratch demo.” I would cheerfully license it to any established artist, anywhere in the world, who wanted to do a proper production of it. The basic musical treatment is more-or-less what I originally had in mind, but I’m no orchestrator, and some parts are simply repeated. Neither am I a professional singer. Even though I “sang from the heart,” this is the first and only take, with a certain amount of pitch-correction, and with one slight clam. A true professional (team) would know what to do next. I do, passionately, believe that the message needs to get out. Everything that Gen. Eisenhower warned us of has come true with a vengeance, and people simply do not get to see the consequence. In a way, of the people and the families whose lives are savaged by “War, Incorporated,” the dead are the lucky ones. I have seen the maimed ones, including one now-gruesome lad who could not have yet been twenty years old. But the advertising sure is slick . . . The slick manipulation by the media of a much grimmer reality. So glad I played this. Love the starkness and simplicity of it. Slight echo's of Don Henley "Month of Sundays"....quality piece. ...echo my own thoughts about this powerful composition. Thank you for writing it and giving voice to what so many of us believe about war and its effects: there are no upsides! i read every word of your entire post before i even pushed the play button. as someone who has slept in a muddy fox hole, i can tell you, what they sell you and what you get are very different. which I really try to avoid but this is austerely beautiful: perceptively conceived and very well produced. An Iwo Jima documentary from the Japanese point of view. This is a sobering 54-minute documentary that is probably “entirely unlike” your pre-conceived notions of what such a film might be. "This Was Far Removed From The Heroism Of "An Honorable Death"
How much more awful, then, might it be, for earnest young American Men who barely know that their country has been engaged in Un-Declared War for more than fifteen years ... and counting? The horrors of that war are simply not revealed to them. When yet-another airplane full of coffins lands at Edwards Air Force Base, not a “blip” arrives on CNN or on FaceBook. They literally have no idea what they are getting into. So far, I have not yet figured out how to get this piece national exposure . . . Important message. I agree with you here on all counts! Love the first verse lyrics , really evocative.the almost staccato verse delivery gives this a brittle but emotional feel, which really suits the track. Really nice work. ... with just how supremely-institutional the whole damned thing has actually become. Funeral services are held Monday through Friday, except federal holidays, from 9 a.m. to 3 p.m. Saturday services are also available from 9 a.m. to 2 p.m. for placements and services for cremated remains that do not require military honors or military chaplain support. Family members and others attending the service should arrive at the cemetery 45 minutes prior to the scheduled service time. Families will not be allowed entry into the cemetery earlier than one hour prior to the scheduled service. Uh huh ... Thank you for your loved one’s service. (If we fired a cannon at all, you can be certain that we fired it precisely the requisite number of times.) Since we know that we have to perform the same empty ceremony more-or-less twenty other times today, will you pretty-please vacate the gravesite so that we can pick up the chairs? Burial flags are provided by the U.S. Department of Veterans Affairs at no cost. Most veterans are entitled to burial flags. Reservists entitled to retired pay are also eligible. Only one burial flag may be provided per veteran. They are provided as a matter of course at Arlington National Cemetery and at National, state or post cemeteries. For private funerals, flags may be obtained from any VA regional office and most U.S. Post Offices by completing VA Form 2008, Application for United States Flag for Burial Purposes, and submitting it with a copy of the veteran’s discharge papers at any of those locations. Additionally, those eligible for full military honors at Arlington National Cemetery may use the caisson, if available. Officers in the rank of colonel and above in the Army and the Marine Corps may be provided a caparisoned (riderless) horse, if available. General officers may receive a cannon salute (17 guns for a four-star general, 15 for a three-star, 13 for a two-star, 11 for a one-star), if available. Each service has variations to these funeral honors. The president of the United States is entitled to a 21-gun salute, while other high state officials receive 19 guns. As I said before, fine writing. A hell of a piece Mike and your recent links are quite eye opening. Sad and disturbed times we but then again, haven't they always been? Got my attention for sure,,,Very powerful stuff Mike. Tastefully done. The instrumentation perfectly frames and supports the vocal and its heartbreaking message. It's actually hard to write anything in response to your song since it just touches so deeply. I can say that I think you're right on the mark, your performance here gets the meaning out beautifully, and the I hope that it resonates in the world to end the lies and madness we perpetuate on ourselves and our children. Thanks Mike. Appreciate the ability to download it too. but poignant and unfortunately as relevant as ever. Someone even wants to throw a big parade in DC to further glorify the horrors of war. Appreciate your analysis in the description. A great theme well thought out. Curious how you record your vocals, they are kinda echo-y, makes them tougher to listen to than need be. If it's intentional, ignore me, if it's not, let me know if you want any suggestions about how to get rid of that. So full of messages and social significance. Are we supposed to actually read the whole description?